Master's degree and certificate of advanced study candidates attend the 5 p.m. ceremony. The Registration & Tickets page provides ceremony registration and guests ticket procedures. Following your ceremony, you and your guests are invited to attend the festive reception held in the Campbell Student Union. No tickets are required for the reception. Master's/C.A.S. Grads: Doors open at 4 p.m. Report to the Ice Arena no later than 4:30 p.m. See Sports Complex map. Bring: Grad lineup ticket for 5 p.m. ceremony, cap, tassel, gown, master's hood and/or C.A.S. stole. Leave all belongings with your family. You may bring only a cell phone with you. Guests: Doors open at 4 p.m. Guest tickets required for all entrants. Located at E5 on campus map. The ceremony runs 5 p.m. to approximately 6:30 p.m.
As you enter the lineup area in the Ice Arena, you will receive a name card. Write your name as it should be pronounced and keep the card with you. (During the ceremony, as you walk across the stage, you will hand that name card to a faculty member who will announce you.) Find your place in the lineup with your department as organized by school, or by multidisciplinary studies, or by C.A.S. If you wish to sit with a friend in your academic school, lineup directly behind or in front of that person. Signs will be posted and volunteer ushers will assist you. Leave your personal belongings with your family and carry only your name card with you and, if you wish, a cell phone with the ringer set to silent and that you can tuck into a pocket under your robe. You may not carry anything in the academic processional or bring with you babies, children, guests, animals (except certified service animals), purse, camera, etc. A program will be on your chair in the Sports Arena. Master's degree candidates: You will wear your cap and gown and drape your hood over your arm. Wear the mortarboard square on your head, parallel to the ceiling. The tassel should be on the left front side signifiying you hold a bachelor's degree. You will march in carrying your master's hood over your right forearm. The velvet trim will be closest to your hand with the narrowest (triangular) section of the hood to the outside. This will ensure that when you extend your arm during hooding, the hooder will grasp the section of the hood that goes over your head. See hooding instructions. C.A.S. candidates: You will wear your cap, gown, and appropriate master's hood and drape your stole over your arm. Wear the mortarboard square on your head, parallel to the ceiling. The tassel should be on the left front side, signifying you hold a bachelor's degree. You will march in carrying your stole over your right forearm with the velvet trim closest to your hand. See vesting instructions. Stay with your group so that you will hear the marching instructions when they are given by the seating marshals. A faculty member representing your program will march with your group from the Ice Arena into the Sports Arena where the ceremony is held. They will then join the rest of the faculty marchers, while you continue processing into the Sports Arena under the direction of the seating marshals. A program booklet will be on your seat in the arena. Closely follow the directions of the marshals so that you have a seat. DO NOT SKIP SEATS as you are directed into the rows or you may have to sit with another group...even if it appears that there may not be enough seats. Following the seating marshals' instructions. Once directed to your seat, remain standing for the singing of the national anthem. MALE CANDIDATES: Please remove your caps during the singing of the national anthem. The convener will direct everyone when to be seated. During the ceremony, the seating marshals will direct graduates to the stage to be individually hooded or vested and congratulated. Have your name card ready. You may not carry anything or bring anyone with you as you walk across the stage. If you brought a cell phone with you, tuck it into a pocket under your robe. Just prior to stepping onto stage, a professional photographer will take a formal photo of you individually. Then hand the reader your name card. He or she will announce you as you are hooded. Hand your hood or stole to the faculty member assisting with the hooding and vesting. You will not receive your diploma at commencement. The Graduate School will mail your diploma to your permanent address approximately six weeks following the conferral of your degree. At the close of the ceremony, you will remain standing at your seats until the Platform Party and faculty have recessed. At that point, follow the seating marshals to exit. Make a plan where to meet your family...either inside in the second floor reception area of the Sports Arena (adjacent to the Ice Arena) for the Master's/CAS Celebration, or plan to meet outside the Sports Arena. No tickets are required for the reception. Welcome to your Buffalo State Alumni Association. Upon graduating, you become one of more than 110,000 alumni living in Western New York and around the world. As a graduate, you are a member for life. With your Alumni ID, you have access to benefits and services offered specifically to alumni of Buffalo State, including both on-campus and off-campus benefits. If you would like to receive and Alumni ID card, please click here to request one. 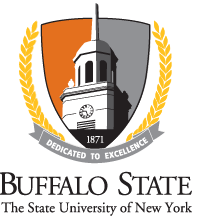 Visit the Buffalo State Alumni Association website regularly to learn about upcoming events around the country, update your contact information, and be part of alumni life at Buffalo State.